Over the Christmas period, we saw the rise in popularity of luxury advent calendars, with many retailers trying to tempt consumers away from traditional chocolate versions with those including an assortment of alcoholic tipples and luxury beauty offerings. In the same way, retailers are now attempting to continue this trend into the Easter festivities. Every time I have scrolled through my social media feeds over the past few weeks it feels as though there’s been a new post about an Easter egg that has been released as an alternative to the traditional chocolate egg. For all the cheese lovers out there, who prefer a cheese board over a chocolate egg any day, Blacksticks have created a solid cheese Easter egg. 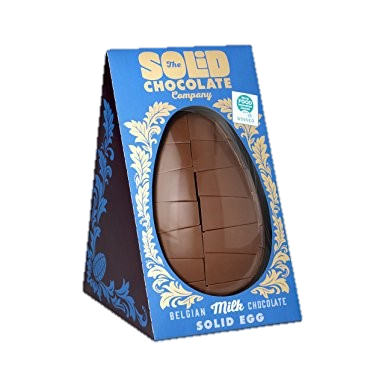 Whilst you only get half an egg, rather than a full one, it’s sure to make all your cheese dreams come true. Whilst not technically an egg, the peanut butter lovers amongst our team wouldn’t let me get away with not including the Reese’s Reester Bunny, a milk chocolate bunny filled completely with Reese’s peanut butter. 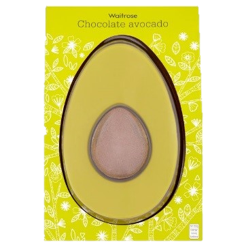 This Waitrose chocolate avocado egg took the social media world by storm. It’s popularity online is mirrored by its sales figures, with Waitrose claiming it was the fastest selling own-brand Easter egg ever sold in its 114-year history – that’s definitely something to shout about! Do you ever feel disappointed after you’ve finished your Easter egg and wish it was more than just the shell? Well, look no further, The Solid Chocolate Company saved the day. I think even I would struggle to finish this in one sitting. If you don’t fancy splashing out on the Booja Booja egg but are still in the market for a plant-based alternative, look no further than the Moo Free Easter eggs available at most supermarkets. As well as being suitable for vegans, they are also gluten and soya free. If you are looking for something more traditional, you can’t go wrong with the classic Cadbury’s Dairy Milk Easter egg However this year, they’ve stepped up their game by incorporating bits of their most loved chocolate bars into the shells of their eggs, something I can definitely get on board with. And for all the beauty fanatics out there who are looking for something a little less chocolatey, you’re in luck! L’Occitane have released an egg containing a few of their most loved skincare products, whilst if make-up is more your thing, I Heart Revolution’s Surprise Gold egg includes 5 different eyeshadow shades and 2 highlighters. Speggtacular! Times are difficult for some retailers right now, with increasing amounts of competition and ongoing price wars so they are having to fight harder to win our hard-earned money. Innovation in range and offering something quirky / different is thus key. With a seemingly endless supply of new products available, consumers can get bored easily with tired formats and are constantly looking for surprise and delight. I can’t wait to see what they come up with next and egg-spect great things next year!